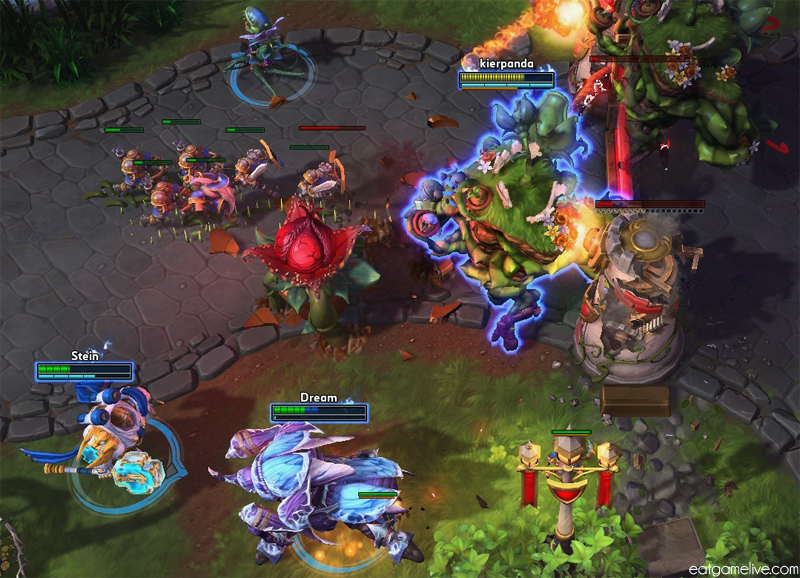 If you’ve had a chance to play the Garden of Terror map in Heroes of the Storm, you will completely understand the importance of eating your vegetables. LET ME IMPROVE YOUR WEAK FLESH! On the Garden of Terror map, players are encouraged to collect seeds by smacking Garden Shamblers and the Garden Terror. Once your team collected 100 seeds, you can return to your base and summon your own GARDEN TERROR! When a player controls the Garden Terror, they are free to roam the map and cause havoc. Typically, what I try to do is run straight for the towers and start smacking away. There’s just something so darn awesome about being a giant plant and rampaging across the map. ROOAAARRRRR. 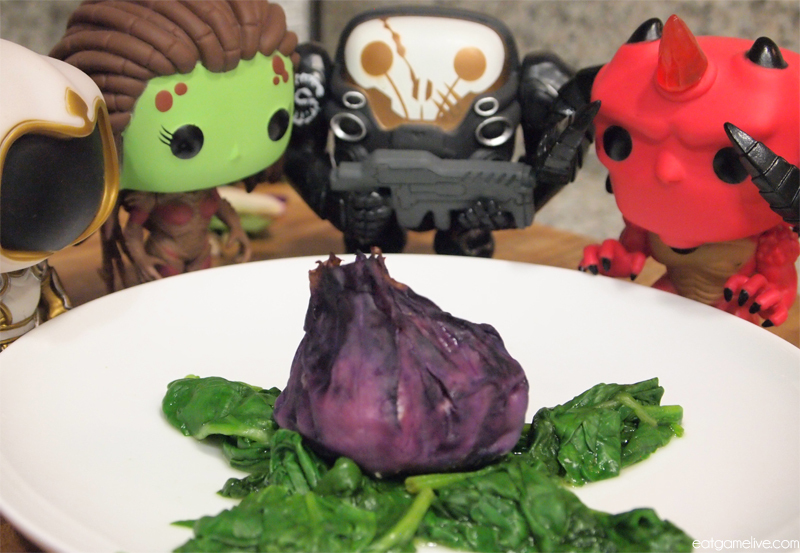 However, one should not play Heroes on an empty stomach… So I’ve devised this recipe to curb your hunger while channeling your inner Hero of the Storm! Since the seeds are key to success on this map, it seemed natural to recreate such an important feature in food. 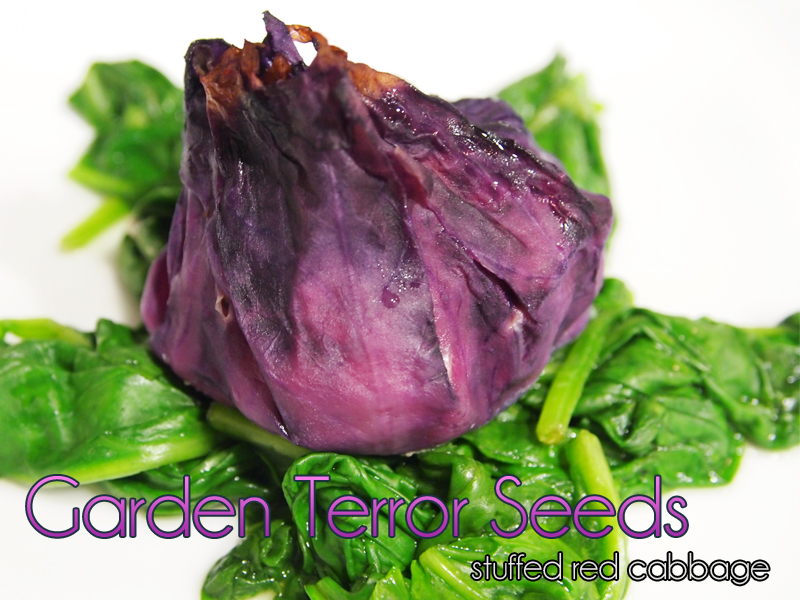 Carefully peel the leaves from the red cabbage. 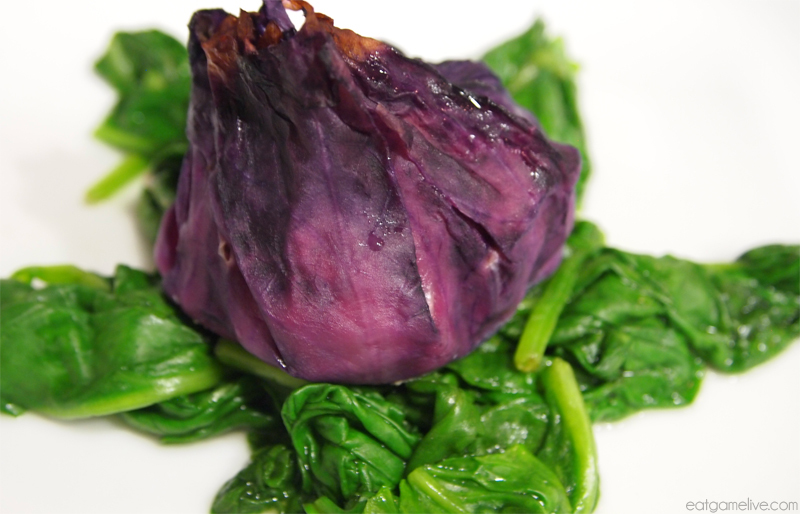 Place leaves in boiling water for about 6 minutes or until soft (the water will turn dark purple). Set a pan on high heat and add olive oil. Add in your diced garlic. Let garlic brown. 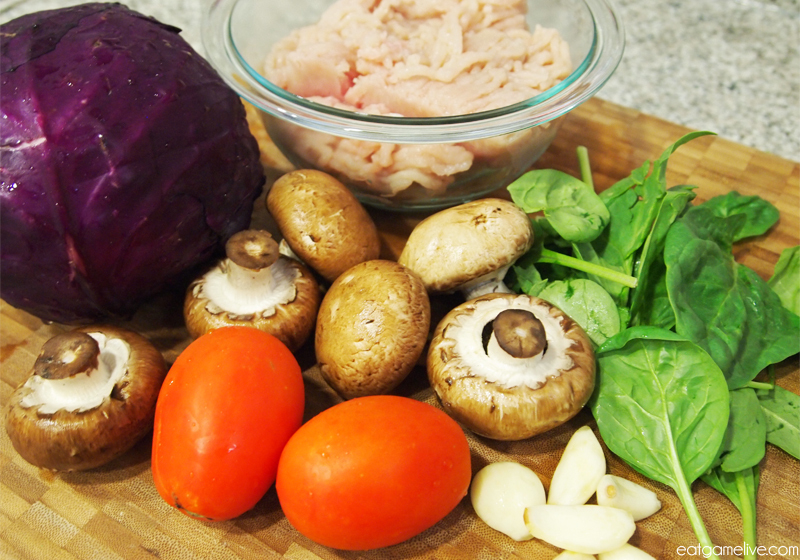 Then, add in your mushrooms and tomatoes. Saute for about 5 minutes. In a bowl, combine your ground turkey, salt, pepper and worcesteshire sauce. Add in your sauted vegetables. Mix until combined. 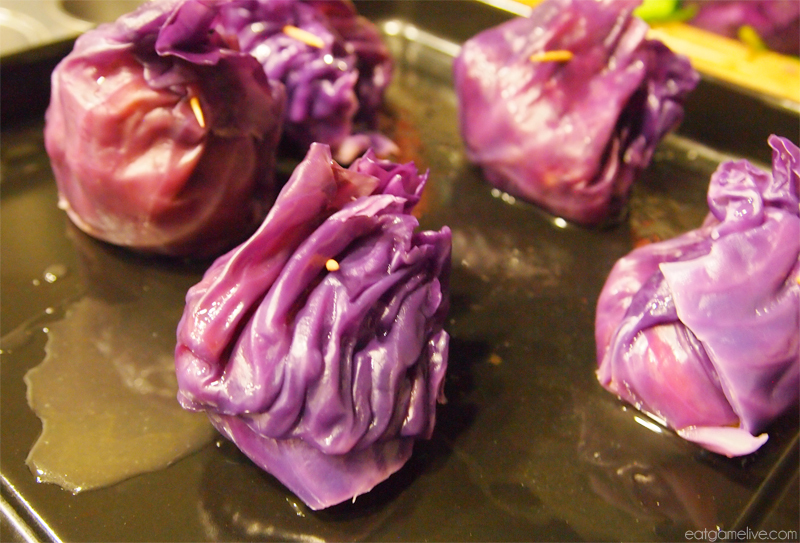 Take a tablespoon of meat and place it in center of one of the cooked cabbage leaves. Then fold the edges of the cabbage leaf to create a pouch. Use a toothpick to hold the top together. Place the “seeds” on a baking dish and bake for 25 – 30 minutes at 375° F.
While the seeds are cooking, lightly boil your spinach. It will take about 2 minutes to cook. Once the spinach has cooked, drain it and arrange it to form leaves on the plate. Remove the seeds from the oven and place them on top of the spinach. And BOOM, you’re done! GG WP! I’ll see you in the Garden of Terror… But let’s hope you’re on my side! GOOD LUCK, HEROES! This entry was posted in heroes of the storm and tagged blizzard, cooking, diablo, gamer food, gaming, healthy food, heroes of the storm, nerdy, red cabbage, starcraft, warcraft by admin. Bookmark the permalink.